Later this year, Dark Horse Comics will release The Massive, a new ongoing comic book from writer/illustrator Brian Wood (DMZ, Channel Zero, Northlanders). In this apocalyptic series, every gloomy forecast for climate change rattles the planet at the same time, and a group of environmentalists must uncover why the ecosystem's gone to pot. Brian took io9 through the design process for the first issue of The Massive. Here's an exclusive behind-the-scenes look at how a comic cover gets prepped for stores. I'm going to take you through the process that I, artist Kristian Donaldson, and editor Sierra Hahn went through in crafting what is the cover to The Massive #1, the first issue of the ongoing series that kicks off in June (the three prequel stories appear in Dark Horse Presents #8-10, Jan-March). This, despite all appearances, is a sketch for me. I sketch digitally, often using placeholder images and roughed-in color, since its so much faster for me to do, plus if its approved, I already have half the work done, at the correct size and resolution. So I did this, and it was rejected. I can see why –- it's a little bit too much like the DHP #8 cover, and its also very much in the style of my past work and perhaps that's not the best way to present a brand new series. Although there are aspects to this I like a great deal and some of it will probably show up in promo images and other related design. Around this time we locked in the incomparable John Paul Leon to be our regular cover artist, but due to a scheduling quirk he could not do #1. So we asked Kristian, currently super busy in interiors, to work with me on coming up with something. I did a few sketches, this time a little rougher and in black/white, to give him some starting points. I also dropped in the Dark Horse logo and other cover elements like the barcode so we know more precisely how much space we have to work with. Sketch #1 took the day, and it was my favorite as well. So we passed it along to Kristian for him to make his own and take it to final. It presented a few problems that I could see: it was really crucial to separate the two halves of the cover, so that earth presented as the earth, and not some other planet looming in the sky. Or the foreground coming off like the moon. Or the earth not reading as a planet but some kind of giant rubber ball hanging in the sky. I also didn't want a realistically colored earth, with crayola-blue and green. I always favor limited palettes and non-representational color. Were it up to me, I would have kept it black and white. Which was quite a shock after only seeing a black/white sketch. I thought the red color was smart. Sure, it may come off as Mars or something, but I wasn't overly worried. Kristian has tremendous talent, but one of his all-time strengths is color theory, and I would never question that. Red works, he nailed it. The logo is also perfect. It was my design, but he used really subtle color to sink it into the art just a bit. The bottom half wasn't there yet. The hard line separating the too halves was probably too severe, and I missed the sense of distance in the sketch, how the landscape goes back to the horizon. Now I felt we had that "rubber ball in the sky" problem, by positioning the earth within the space occupied by the ship and the people. It literally appears to be hanging fifty feet above the ship. The background ice cliffs were working against us, but that aside, the bottom half was really coming together. I did request to off-center the trio of figures, to allow for the title treatment and also so it wasn't so perfectly in line with the earth. And me following up with this. I think, literally, we did all of this in 10-15 minutes. The goal was to try and resolve the issue of the background ice shelves. I felt that compass design element was probably unnecessary and working against us, so I deleted it and further separated the earth from the ice. I also offset the figures and dropped in placeholder text so Kristian would know, roughly, how much space to leave. Which is our final cover. He took the clouds off the earth to allow us to see continents. 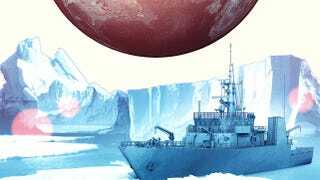 He did some impressive rendering on the earth itself, drew the final ship, the figures, and the ice shelf, and re-introduced the compass element in a way that worked, subtle as it is. There is coldness here, now, that really works and the earth has an almost alien feel to it that is not alien in the "outer space" sense, but rather "what has become of it?" which is really what The Massive is all about. I think, from sketch to final, we're talking a day or two. It was quick, and at the same time a very important piece of art, as any #1 cover is. Like I said, JP Leon is taking over covers with #2, but this same level of care and design and consideration that Kristian took with #1 he's also applying to every panel of the interior art. Wait till you see it. In addition to The Massive, Brian's penning a new Conan The Barbarian series that hits stands next week. You can check out a preview of that here, and read Brian's sketchbook for free here. Read an exclusive sneak peek of Dark Horse Comics&apos; Conan The Barbarian!